None of the shoes shown here are timid. These are just a few of my personal favorites- the collection is extensive and impressive. Rich discussion and analysis resulted as part of the session, which I hope at some point we will be able to write up for you. 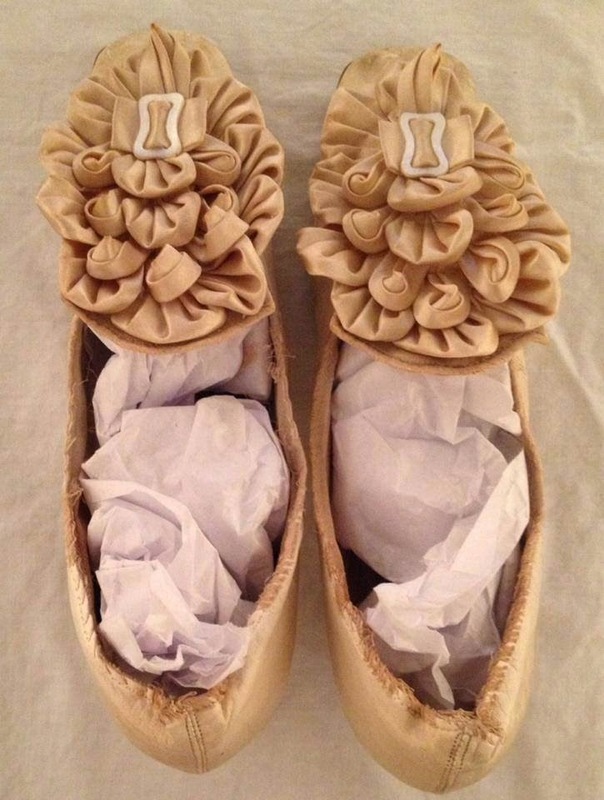 You have to appreciate the dramatic flourish of this over-the-top satin pleated "bow" ornament which dominates these 1876 cream kidskin wedding shoes. 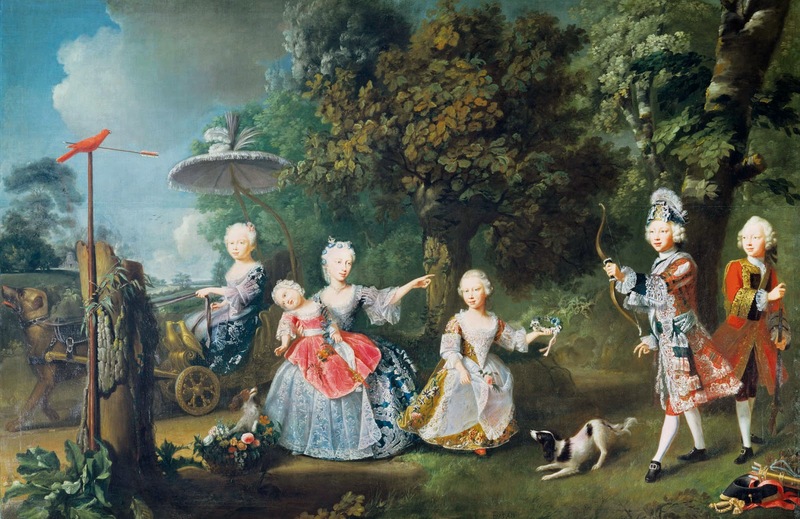 They were worn by Catherine Black for her marriage to Herman F. Myers and have a Marie Antoinette revival flair. These bright boudoir slippers would have been the ideal indoor footwear for an elite woman, adding some dash beneath her wrapper. 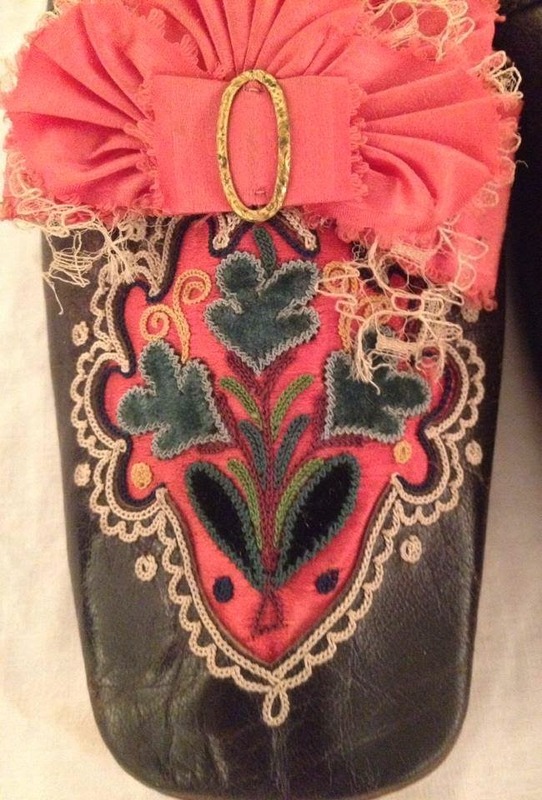 Of dark brown leather with red binding, all the emphasis is placed on the front of the slipper with its pleated pink bows, and appliqued green flowers set against a pink panel, c. mid 19th century. 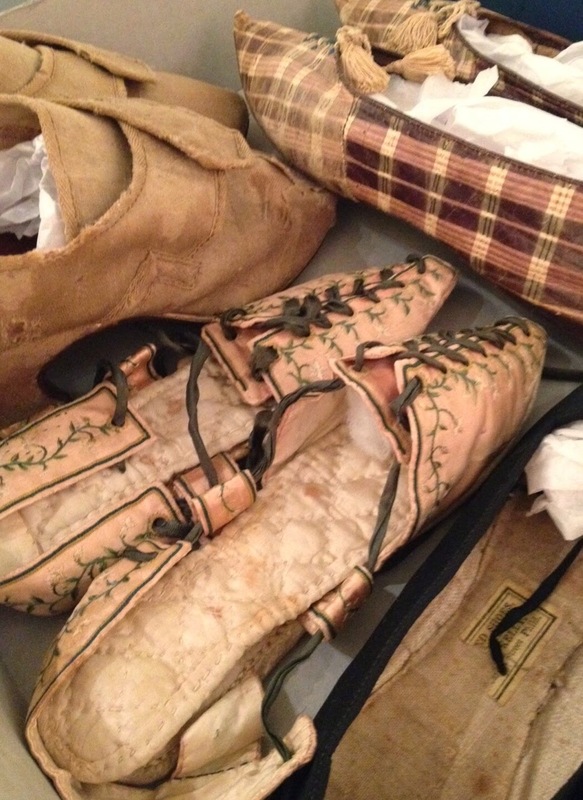 There are two pairs of c. 1800 shoes which really caught my attention and inspired my pen. If you have followed SilkDamask on twitter or facebook, you will know I have a penchant for plaid. These kidskin shoes with white/purple stripe plaid immediately captured a place among my footcandy favorites! Look at the elegant tassel ties and the impossibly pointy toes, c. 1800. Imagine how they would have looked, with accessories, visually breaking up the solid colors associated with white cotton, muslin, linen or silk of Neoclassical/Regency columnar dresses. These are indeed rare slippers or sandals as they would have been known by the fashion forward ladies of the late 18th-early 19th century. The pink satin vamp has two pieces, laced together with a dark green ribbon. The sides and heels are open. The pointed toe has green embroidery in the form of tendriling vines, a perfect classical motif to accompany the slippers. The soles are suede and the insole features a removable quilted lining – I suspect these shoes were made for indoor wear, most likely for dancing. 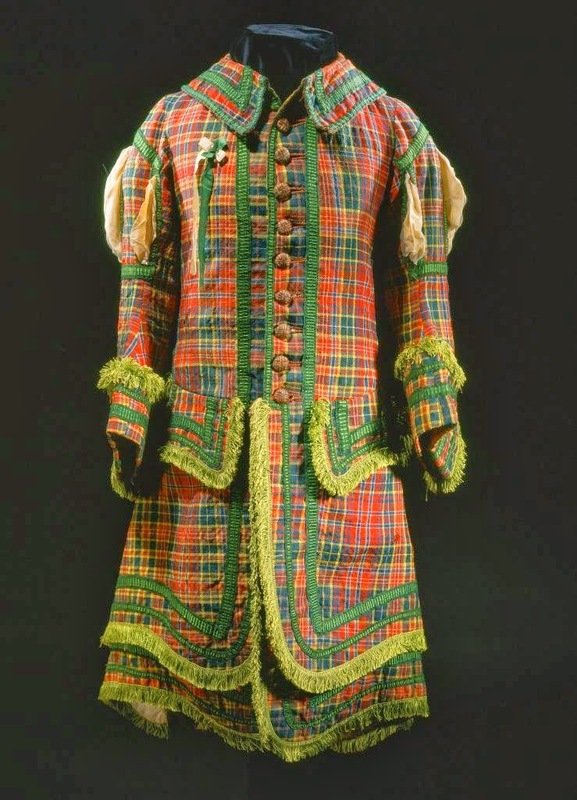 The exhibition “Profiles: Chester County Clothing of the 1800s” is on view through 30 August 2014. 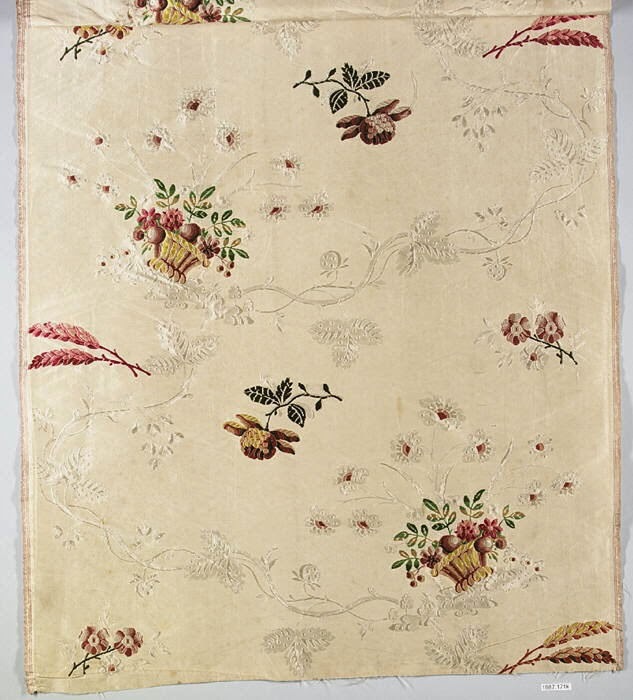 Seeking new financial opportunities as a single woman, Henrietta Maria East arrived in Boston from London in 1743 with a rich stock of textiles (such as the c.1750 Spitalfields silk from the Metropolitan Museum, above) and other goods. She opened a millinery shop in the heart of the town, on Marlborough Street. 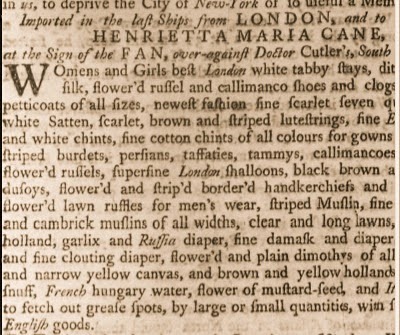 Judging from the advertisements she placed over time in the Boston Post Boy and other newspapers as well, she kept a well-stocked shop of prized textiles and accessories. As recounted in Patricia Cleary’s noted 2000 publication, Elizabeth Murray: A Woman's Pursuit of Independence in Eighteenth-Century America, Henrietta’s decision to marry in 1747, had devastating consequences for the young entrepreneur. 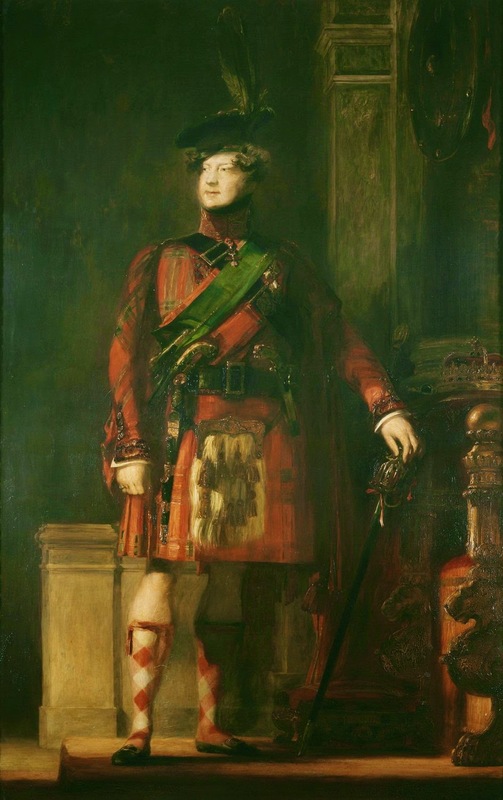 Cleary reveals that Henrietta married Londoner Hugh Caine, who, as it turned out, was already married and had a wife at home. 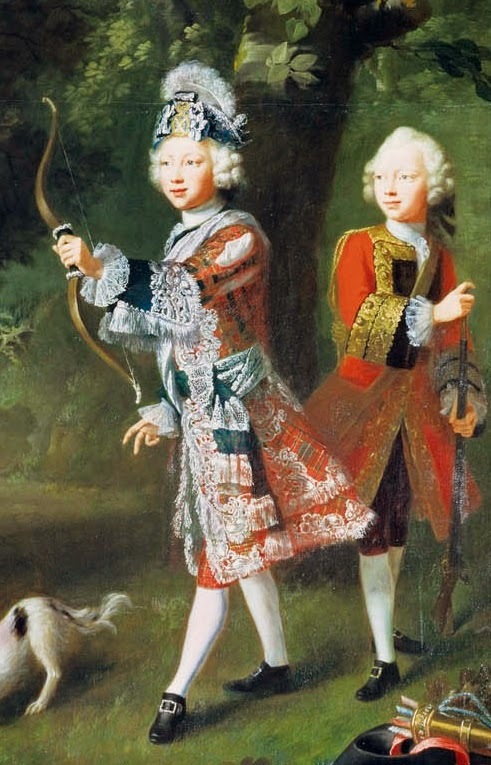 Not only a bigamist, he abandoned Henrietta in 1751, helping himself to her hard earned property. She would later reveal that during those four years of marriage she sustained his violence toward her. Unfortunately, Hugh Caine's departure did not end the problems caused by the marriage. 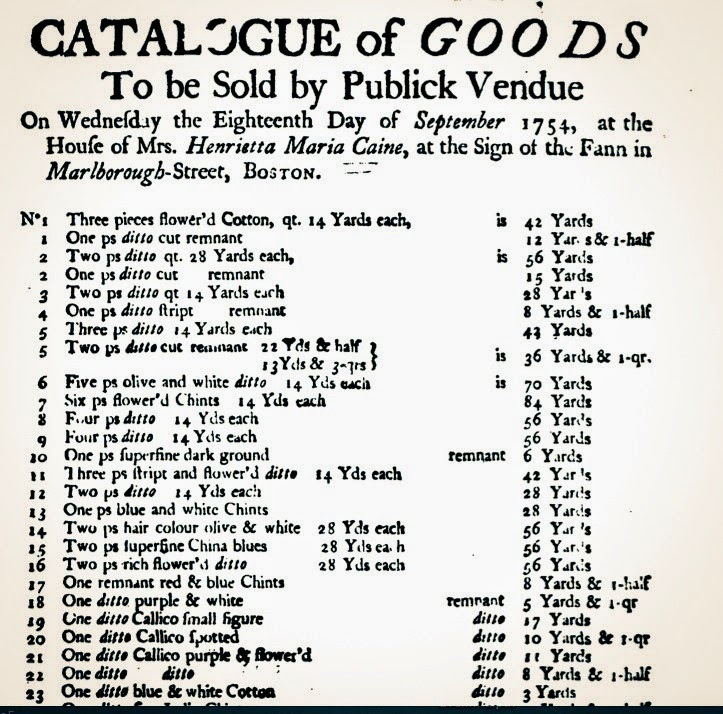 Henrietta Maria East Caine remained legally responsible for all of his debts and found merchants unwilling to trade with her because of her connection to a bigamist, despite his departure. The legal bonds that women experienced with marriage limited her ability to act independently. Eventually, she turned to the courts to dissolve her marriage, but once again, met without success. She was literally trapped by the legal system and her ultimate demise was not a happy one as you might expect. For more on Henrietta Maria East Caine's life and career, see Patricia Cleary, Elizabeth Murray: A Woman's Pursuit of Independence in Eighteenth-Century America (Amherst: University of Massachusetts Press, 2000), 45-46, 57, 60, 62-63, 241n. 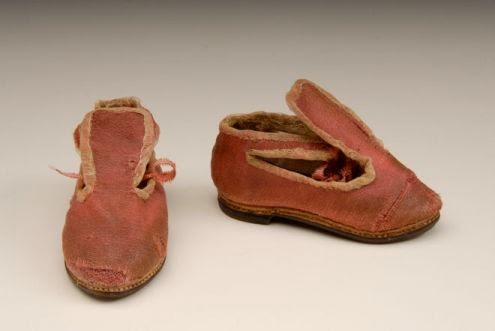 These darling infant or toddler's shoes are of a pink wool calimanco (also spelled calamanco, callimanco) and date to 1763-68. Held in the textile collection at Historic Deerfield, an 1888 note accompanied the shoes, stating that they were from the Root family of Connecticut, worn by Wealthy Peek Bardwell, c. 1763. 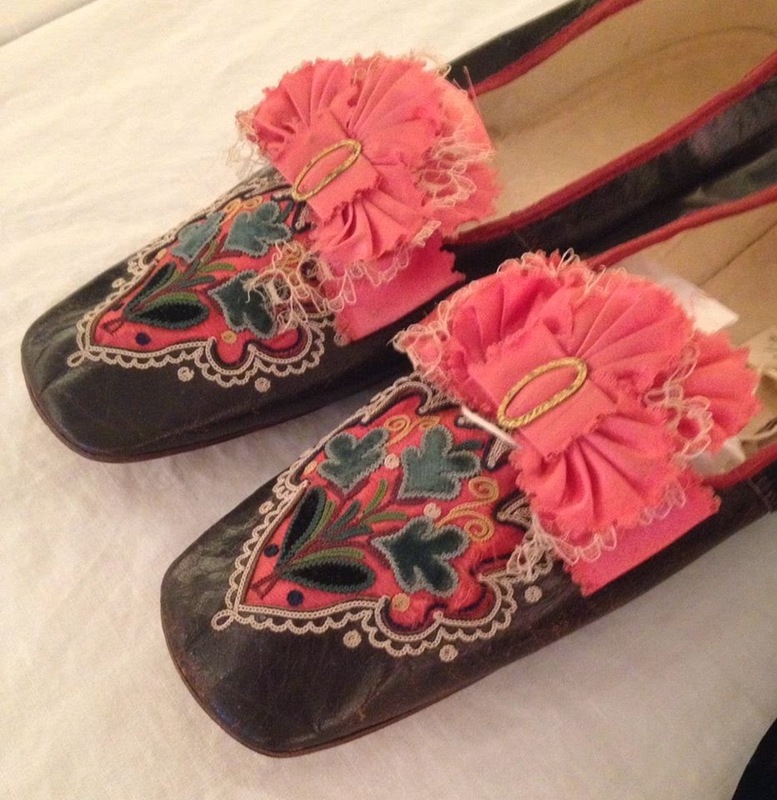 I am currently seeking information on Wealthy, for these tiny shoes raise more questions then they answer: Who made these charming and carefully detailed shoes? Did she grow to adulthood? Did she marry and have children of her own? Recently conserved (see link below), the wool fabric indicates significant wear, particularly at the toe. It is highly likely that these American-made (Connecticut?) shoes were made from the remnants of an earlier garment or textile. They incorporate a delicate pink silk ribbon for fastening. The shoes are bound with a lighter linen ribbon. The hand stitched leather sole is sturdy, with a slight heel. My initial assumption was that these were toddler's shoes due to the well-crafted, layered sole, the leather insole and extensive wear on the toe. However, Wealthy's diminutive shoes are only 3.5 inches in length. By today's measure, this translates roughly to an infant's size one shoe (16, Euro; .5 UK) and would be made for a child 0-9 months - a child who may not have been learning to walk but perhaps spent time twirling in a child minder or crawling. In addition, while the toes exhibit wear, the soles show very little. 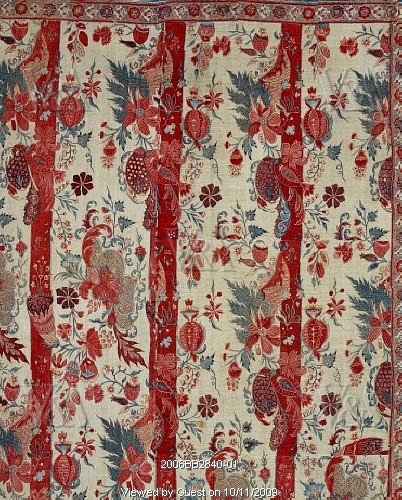 No matter how the shoes were worn, they are a rare, fragile survival and have benefited greatly by being in the Historic Deerfield textile collection, which in turn benefits the historically curious. My thanks to Ned Lazaro, Collections Manager & Associate Curator of Textiles for his assistance. From Historic Deerfield, Deerfield, MA.